Kinase inhibitors are enzymes which selectively block the action of other enzymes, and help in regulation of the activity of other proteins and, the activities of cells. Globally, growing focus of pharmaceutical companies on R&D to come up with potential medicines for treatment of cancers, rise in the in aging population, and increasing incidence and frequency of various cancers are the prime growth drivers of global kinase inhibitors market. 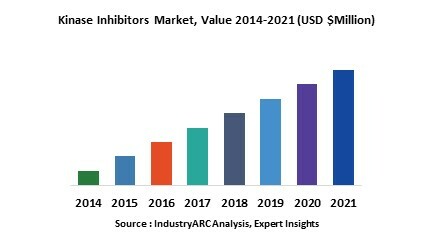 In addition, increase in adoption of kinase inhibitors for newer applications, and emerging economies such as China, India and others, will create new opportunities for global kinase inhibitors market. However, The research and development having higher cost, complex approvals processes, and stringent government policies are the key restraints for global kinase inhibitors market. This report identifies the global kinase inhibitors market size in for the year 2014-2016, and forecast of the same for year 2021. It also highlights the potential growth opportunities in the coming years, while also reviewing the market drivers, restraints, growth indicators, challenges, market dynamics, competitive landscape, and other key aspects with respect to global kinase inhibitors market. Geographically North America dominated global kinase inhibitors market, and Asia Pacific is projected to have fastest growth, owing to rapidly increasing aging population, growing incidence and prevalence of cancer patients and modernizing healthcare infrastructure in the developing nations such as China, and India in this region. Among all the end-users, hospital segment has the highest market share in global kinase inhibitors market. 14.4. AstraZeneca, Eisai Co., Ltd.